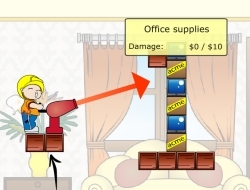 If you destroyed all the items in the previous skill game called Max Damage then you will surely be pleased to see that this second version is here and you will be able to break some new items now. If you are new to this awesome shooting game then you will soon learn that the goal here is to destroy as much of the items as possible. There will be all kinds of stuff there but mostly appliances as they are most fun to destroy with the balls that are shot out of the cannon. Your shots are numbered so try to aim them well in order to get the highest ratings in each level. Use the mouse to aim and fire the shots. Max Damage 2 0.00 between 0 and 10 based on 0 votes.